The earliest Spanish explorers to enter the region that now is northern Argentina heard marvelous stories from the Indians of a large block of iron that had supposedly fallen from the sky. The place where it lay was called Pigüem Nonraltá, or, in Spanish, Campo del Cielo (Field of the Heaven). In 1576 a military expedition visited the site, returning with a few small pieces of a very large mass, which came to be known as the Mesón de Fierro (Large Table of Iron) estimated to weight about 500 Q (23 mt) (Cassidy et al. 1965). 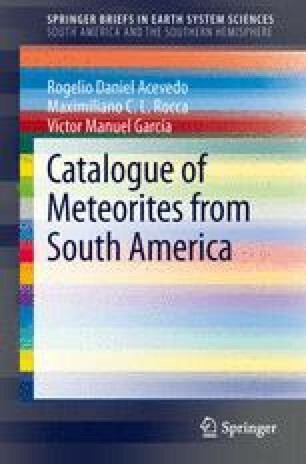 Campo del Cielo is the flagship of the Argentine meteorites. Chaco, the main mass, is the second largest known meteorite (as a single piece) at the Earth’s surface.